Mid-Century Modern is an odd type of décor. This is the era that gave us thin, boxy couches, narrow rectangular utilitarian desks, and olive drab refrigerators and stoves – alternated with mustard yellow appliances. It’s an odd range of years, beginning with almost ultra-conservativism and ending with the wild abandon of the 1970s. Out of this mishmash of social behavior has come some truly incredible artworks. Abstracts in bright colors are certainly a part of the mid-century modern wall décor. “Mid-century” in this instance refers to the years between 1945 – shortly after World War II, to shortly after the 1970s. This includes the era in which “art” could be created by literally throwing paint at an oversized canvas. While some of those canvases were just accidental arrangements created with the thrown paint, others were more planned. One artist even incorporated his burned cigarette stubs in the picture. As you can see, it was an era that embraced everything from metal rain chimes to paisley bell bottoms. It was also an age when people were just starting to understand the supreme importance of preserving our natural world. Nature paintings, ocean scapes and more became popular to hang on your living room wall. It also became popular to incorporate natural items into artwork. Driftwood, for example, became a material frequently used to make lamps, centerpieces, and even practical items such as coat racks. Therefore, midcentury modern wall décor can embrace a wide range of materials and motifs. It can include reliefs, sculptures, oil and acrylic paintings, as well as water color. It almost seemed as if artists were vying with each other to create the most original art style possible. Failing that, they rivaled each other for new and unusual ways to produce their works of art. Joni, who painted holding a paintbrush in her teeth, for example, or Close who strapped a brush to his unresponsive hand to produce gigantic murals. Below are listed ten varied and interesting arts from the mid-century modern movement. As you can see, they are eclectic. But this means that no matter who you are, you are likely to be able to find the perfect piece for your wall. The different sized squares in this wall décor have different shades of white to them with the darker in a center line. 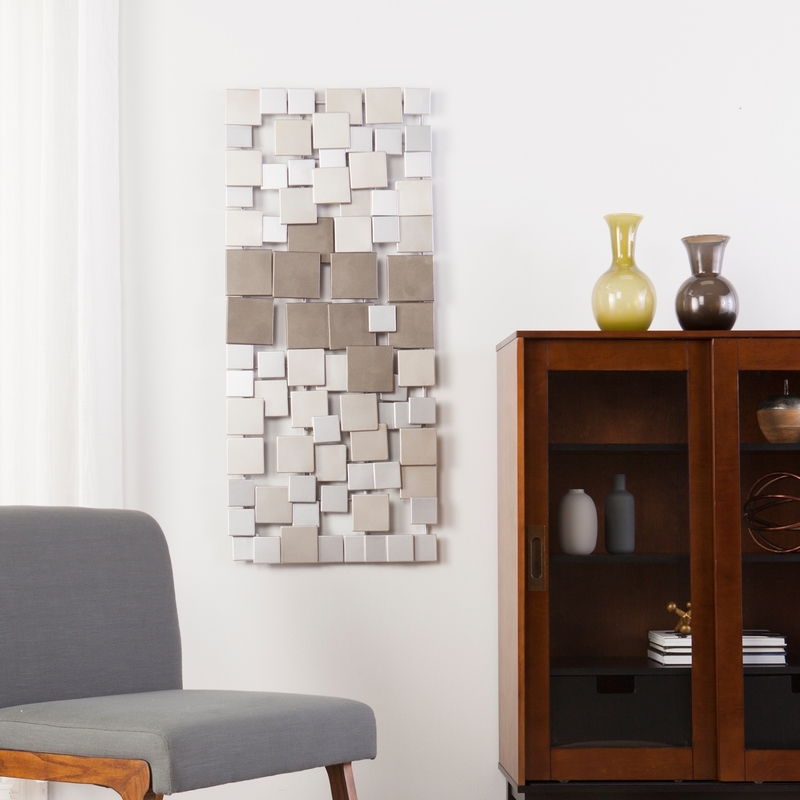 Able to work as a horizontal or vertical standing décor these squares add texture to your wall. The light tones can work well against a light tone wall or bring expression to a darker modern tone. This wall décor features three sailboats of classic builds and nature. The sails are all frames edging to give you the choice if you want to leave them open and let your wall add to the décor or line them with fabrics to bring color to your modern room. The light tone works well with your lighter wall tone and light blues. With the shapes of silverware, this décor can add a cooking feel to your kitchen. The darker metal tone will work well with a light wall color as the backdrop or mounted on your cabinets themselves. The contrast will bring eyes to an area of the room adding to your décor or your fresh foods that are ready to eat. These metal rings have a distressed look to them with a burnt tinge that will express handmade work and uniqueness. The different colors range from light silver to dark metallic tones allowing it to work with many styles. This piece can bring eyes to the part of your room where you want your décor to stand out. This modern wall décor is very large and makes a wonderful wall centerpiece over a sofa or major piece of décor. It can create interest and make a conversation piece with its wooden circles on grey metal posts. This piece is great for a large white or light wood tone wall and it brings some light color to your dark tone décor. The seven golden flowers work well on many kinds of walls, from a dark tone bringing in light or on a light-toned wall. They can also bring a traditionally styled room to work with a modern styling with neutral colors. Flowers always have their own meaning as well as the meanings that people get from them. And that’s true with this piece. These abstract metal rings can add flavor and appeal to your home. The iron body of warped rings gives a workmen’s feeling to any room. With a dark tone body, this works well on any white wall or light wood tone. Great as a décor centerpiece, it will bring notice quickly to the area and will highlight the décor around. This piece of wall décor adds a flavor to your room while bringing a modern feeling. The metal backing can bring together a metallic look, especially when added to a light solid-color wall. The frames can be used open or you can put pictures within them, adding more of a personal feel to this multi-surface wall décor.